PUT THIS ON TO SIMMER WHILE YOU DO YOUR LAUNDRY. WHEN THE LAUNDRY IS DONE YOUR MEAL WILL BE READY. SOME LIKE TO ADD RICE TO BEANS, MIX ALL TOGETHER, GOOD BOTH WAYS! Wash beans, soak overnight and drain. 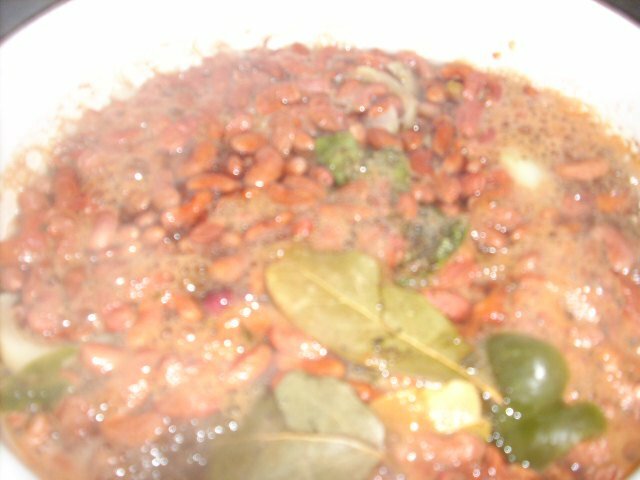 Cover beans and all ingredients with cold water. Bring to boil, reduce heat and simmer until done. Taste test. May take 3 or more hours, according to the climate? AND ALTITUDE. Or just according to the beans. some beans take longer. I cut the sausage in about 1/2 inch slices (on the diagonal) Fry in a skillet until browned on both sides, drain on paper towel, add to beans. Serve over rice, along with cornbread, and sweet tea; and you have a truly "southern style" meal.